Hi, I’m Jurie from Toverberg Guest Houses in Colesberg in the Northern Cape. 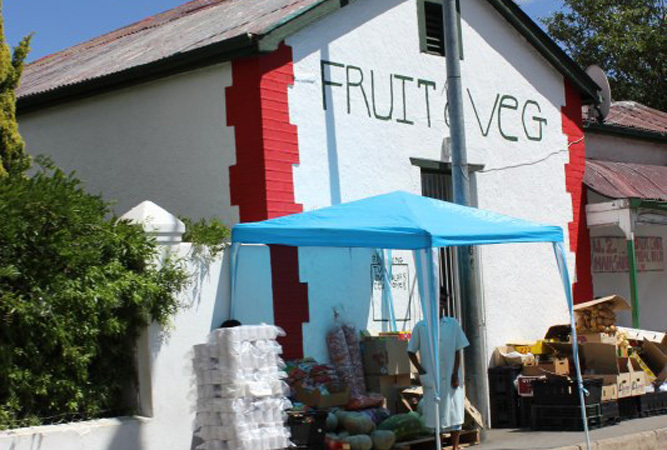 Colesberg IS BEST KNOWN FOR being a convenient stopover between the interior and the coast. Here the N1 and the N9 meet. GET YOUR PICTURE TAKEN AT the wrought iron lamp at the corner of Paul Kruger and Ventershoek Streets – erected in commemoration of Queen Vistoria’s 60th Jubilee. THE BEST sunset PICTURES CAN BE TAKEN DOWN the road passing the golf course. OTHER HAPPY SNAPS AT a number of 19th century buildings and the Colesberg Sloot. WHEN THE WEATHER’S GOOD, I LIKE TO cycle with my road bike along the road past Bastersnek onto the Seekoeiriver – about 20km out. WHEN THE WEATHER’S BAD, I LIKE TO read the local publication All Roads Lead to Colesberg introducing me to a time gone-by and a future full of promise. 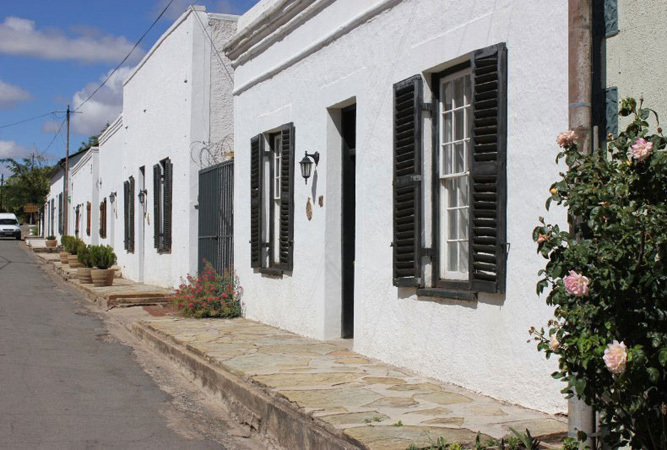 Let your imagination, with the assistance of the booklet, meander through town: You will be intruduced to the stories of the beautiful churches and Karoo houses with their intricate detail meeting interesting characters form the past. 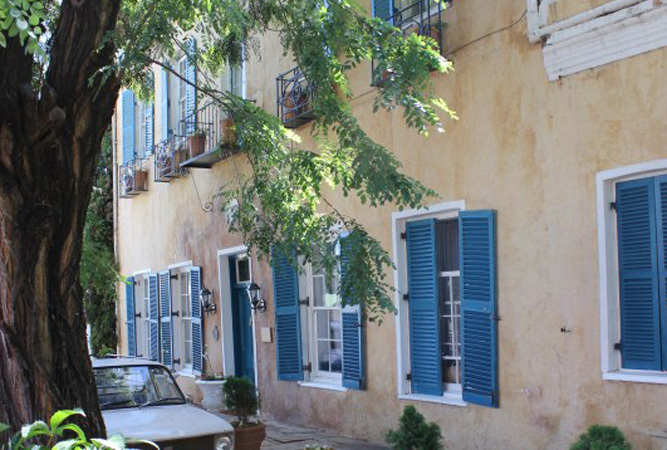 You could sit on a stoep gossiping about passers-by. Or perhaps you can imagine having tea with Helena Stern (by invitation only – ofcourse!) discussing her wedding dress which is now in the Kimberley Museum. You meet Lady Florence Phillips again, daughter of Adolf Ortlepp of Ortlepp House in the main street and are reminded of her contribution to the Johannesburg Art Gallery; of her changing the Koopmans de Wet House in Cape Town into a museum and the restoration of Vergelegen to its former beauty. Take an excursion through the surrounding battlefields, when Colesberg was the Southern Front during the Anglo Boer War, or listen the stories of pain of those during the 1980’s political unrest. You may also feel yourself comfortable on the back of a donkie karretjie of a Karoo Nomad family. Or, maybe you are interested to learn about how many buildings in Colesberg were built from from locally manufactured bricks – all by hand. And, what about Mr Edmead’s memories of the Norval’s Pont pontoon? I THINK THE BEST TIME OF YEAR TO VISIT IS all year round, BECAUSE whether a hot or cold day there is always a good fare and bed (provided you have booked accommodation way in advance – especially during school holidays!). MY FAVOURITE BREAKFAST SPOT IS The Gossip. FOR LUNCH, I SUGGEST The Horse and Mill – one of the only working horse mills left in the country – now serving as the local pub. MY FAVOURITE RESTAURANT IS The Bordeaux, TRY THE lamb shanks! Also try Die Plattelander or JC’s neck of lamb. BEST LATE NIGHT SNACK FROM JC’s. MY FAVOURITE dreaming SPOT IS on top of Coleskop – a climb of about one hour. IF YOU WANT TO MEET LOCALS, GO TO to the golf club, a nine-hole golf course with challenging Karoo fairways but well-maintained grass greens and aprons and well-equipped club house facilities. Colesberg’s BEST KEPT SECRET IS the Lesser Kestrel roosts in the upper part of town. MY FAVOURITE THING TO DO WITH FRIENDS IS fishing along the Orange River or at Lake Gariep. 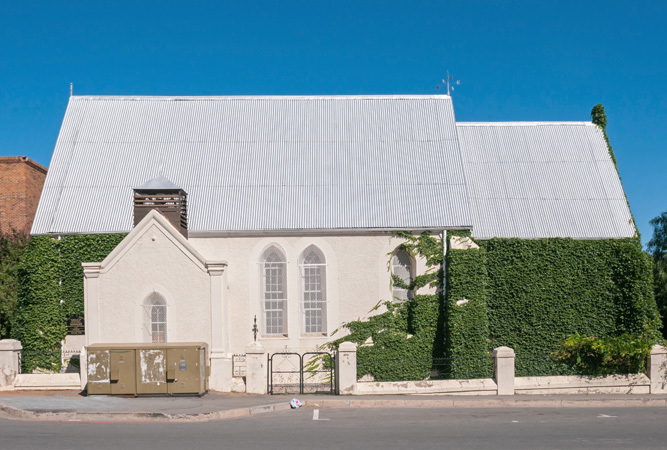 TO RELAX AND RESTORE MY SOUL, I LIKE TO sit in the Anglican Church (1854) designed by Sophie Gray the wife of the first Anglican Bishop in the Cape. Note the beautiful furniture and original organ inside. 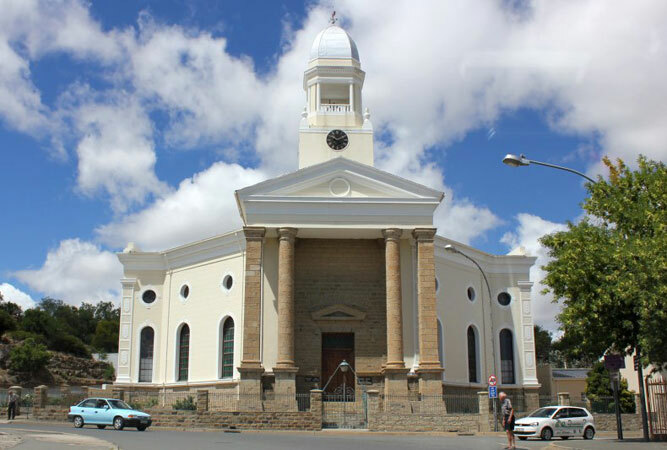 The existing Methodist Church, Reformed Church and Dutch Reformed Church buildings were all complete in the early 1860’s. IF YOU’RE FEELING ADVENTUROUS, TRY climbing Coleskop or tackle the moderate 20km or 70km mountain bike trail – facinating routes through surrounding koppies. MY FAVOURITE WALK IS is the hiking trail next to the N1. It is a 5km moderate walking route through beautiful scenery and local flora. One can also turn off to the Boer Memorial and the Military cemetery behind which lies the old Jewish Cemetery. The Struggle Route starting from the Colesberg-Kemper Museum through Kuyasa takes one on a journey of the political struggle of days gone by. Depending on your family’s sense of adventure or fitness you can also walk the 5, 8 or 12 km Family and Dog trail at the old airport – pass the golf course. It is an easy walk with no traffic. Just remember that there are no water points along any of the trails. IF YOU’RE HERE IN August, JOIN IN THE FUN AT the annual national sled-dog gathering – starting at 5am though. MY FAVOURITE MUSEUM IS the Colesberg-Kemper Museum, the original Colesberg Bank establised in 1861 – with the old bank counter still intact. It also accommodates the local Information Office. Check out the 19th century toy collection and memorabilia. The museum also houses the permanent UNISA Karoo Nomad Photographic Exhibition. Together with the Anglo-Boer War room, the Colesberg room and the Struggle room it offers an exciting reflection on the past and present. 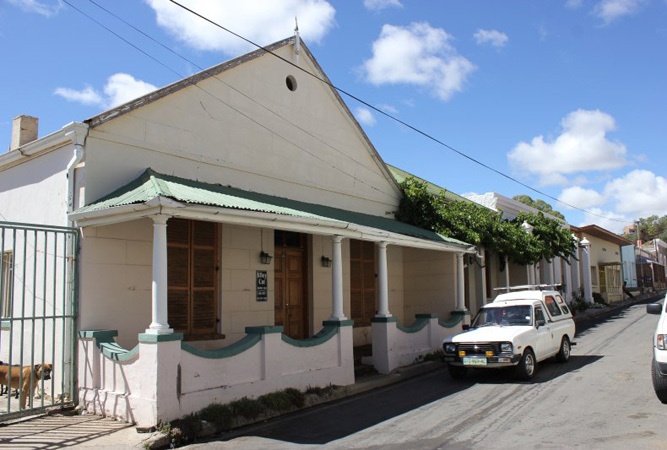 MY FAVOURITE BUILDING IS collection of restored Karoo houses in Bell Street, FOR ITS charm. TRAVELLING WITH CHILDREN? A FUN OUTING IS all restaurants are child–friendly and it is safe to walk in the streets, enjoy the fresh air and friendly local people. THE MOST UNUSUAL THING I SEE HERE IS Hannes and his tractor and trailer – covered in lights – carting locals and visitors through town on Christmas and New Year’s Eve. MY FAVOURITE WEEKEND GETAWAY IS Doornkloof Nature Reserve of about 12 000 ha approximately 45km north-west of Colesberg around the confluence of the Zeekoei and Orange River. The landscape is very mountainous, with abundant kloofs and little true plains. Temperatures range from –8 ºC in July to 41 ºC from November to February with Rainfall which varies between 300 mm to 400 mm, occurring mainly as summer thunderstorms. WHEN I WANT TO GIVE BACK TO THE COMMUNITY, I give to the Badisa Fund for street children – donation boxes are found at most shops. 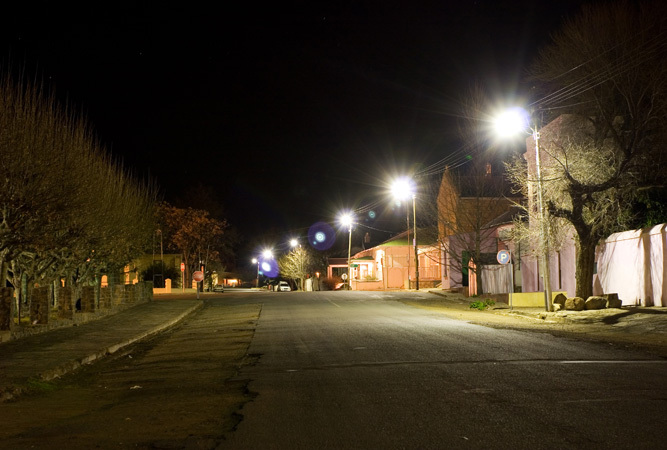 I Love Colesberg Because this is home.